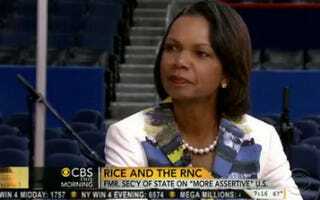 Former Secretary of State Condoleezza Rice, who will speak tonight at the Republican National Convention, gave a preview of her take on President Barack Obama's approach to foreign policy in comments to CBS This Morning, reports the Huffington Post. She says that the voice of the United States in world affairs "has been muted" under President Obama, that U.S. policy on Syria has been ineffective and that Mitt Romney would, unlike Obama, "understand American exceptionalism and would not be afraid to lead from the front." Would she like to help Romney do that? The answer is still no. Asked about a potential administration role, she replied, "I am a very happy professor at Stanford."